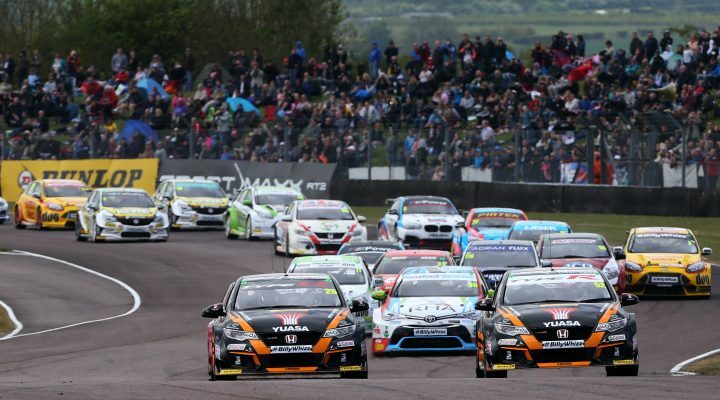 Thruxton is always a favourite on the Dunlop MSA British Touring Car Championship calendar, with cars reaching speeds of almost 160mph, sometimes two and three abreast through the quickest sections, and this year a record crowd lapped up the action. On an historic day for the championship, three-time title-holder Matt Neal marked a major milestone in his career as he matched touring car legend Andy Rouse’s tally of 60 BTCC victories – elevating him to equal-second on the all-time winners’ list. There was glory, too, for local favourite Rob Collard, who finally broke his Thruxton duck – and in some style. Renowned as the series’ best starter, the Hampshireman made the most of his rear wheel-drive advantage when the lights went out in race two and following a power steering issue for Neal, he thereafter staved off the sister Honda of defending champion Gordon Shedden to triumph. Team-mate Colin Turkington then made it cause for a double celebration for BMW by claiming the Bavarian marque’s landmark 100th BTCC success in the weekend’s finale, while the support series also delivered non-stop action from lights-out to chequered flag. The Renault UK Clio Cup, Ginetta Junior Championship and Ginetta GT5 Challenge were all clear crowd-pleasers – delighting the tens of thousands of fans thronging the grandstands and spectator banks in the warm spring sunshine. The young stars of British F4 in particular put on a tremendous show, with a succession of spectacular slipstreaming scraps providing a welcome tonic after recent events. Indeed, Billy Monger was at the forefront of many people’s thoughts, with a Saturday evening track walk seeing fellow drivers, team personnel, championship members and spectators alike pour onto the circuit to raise a further £7,500 towards the popular teenager’s recovery and rehabilitation from the life-changing injuries he sustained last month. The pit-lane was similarly packed for the ever-busy Pit Walk the following morning, with fans taking advantage of the opportunity to fill their autograph books and snap selfies with their BTCC heroes. “What a wonderful weekend of racing we’ve had,” enthused Thruxton Group Managing Director Bill Coombs. “It’s always fantastic to host the BTCC, and it was great to see so many passionate and enthusiastic fans coming through the gates to enjoy the action. “It was also very gratifying to see that the first phase of safety improvements brought to Church Corner over the off-season are yielding the desired effect, with Daniel Lloyd thankfully walking away unscathed after leaving the track at high-speed during the second race on Sunday.